1) This paper was presented at the FIG Working Week in Sofia, Bulgaria, 17-21 May 2015. Land administration in South Africa is an interesting study because it consists of a dual system that has promoted investment in areas where private property rights were permitted, but relegated the Traditional Communities into poverty and disinvestment. The paper shows that the concept of ownership, land rights and title deeds goes much further than the ability to buy and sell property. Notwithstanding the minority of authors that disagree, most research has shown that private property rights provide far greater incentive for an individual to create wealth and preserve the value of his/her assets than State or communal ownership does. In South Africa, policies of separate development and restrictions placed on capital expenditure imposed on the lands occupied by the indigenous people during the colonial era prevented the state from implementing the Cadastre in the communal areas of the country. The status quo persists to this day, which has resulted in a dual system that promoted investment in areas where private property rights were permitted, but relegated the Traditional Communities into poverty and disinvestment. Firstly, members of traditional communities were seldom interested in land as a marketable commodity: community members perceive themselves as the current custodians of land belonging to their ancestors, the living and the members of the community still to be born. This is supported by findings of other researchers such as in Goodwin (2014, pp.9–10). The Government of South Africa recognises 12 monarchs and 774 other Traditional Leaders (Department of Provincial and Local Government, 2002, p.39). Traditional Communities have been allocated approximately 15.5 million hectares of communal land for occupation under these Traditional Authorities, which equates to 13% of the country. It is estimated that there are 15 million people (between 30% and 40% of the South African population) who either live in these Traditional Communities (Department of Land Affairs, July 2004, p.12) or perceive the communal area to be their “home” (Goodwin, 2014, p.2). Apartheid settlement patterns in South Africa have resulted in extra-legal “rurbanisation”, where less-formal urbanisation has taken place in rural confines. Lack of infrastructure (including legal structures) and resources in these rural areas has resulted in suffering, need and dependency (FIG, August 2004, p.14). Seldom is this land occupation recorded in any form of land right, even outside the formal land administration system. The lack of legal recognition of ownership of the land that these communities have occupied for generations may have resulted in unwillingness of members of those communities to invest time, effort or capital into the land they call their own. It certainly cannot be viewed as a capital asset. Yet, well-defined boundaries of fences or hedges, which surround many homesteads in these communal areas, indicate an informal yet recognised exclusivity and right of use. The South African Government’s own Accelerated and Shared Growth Initiative (ASGISA, 2006, p.14) recognises that land remains an unusable or “dead” asset until land tenure is instituted and formalised. Property rights are one of the market-supporting institutions missing in the communal areas and, because they are a missing component of the infrastructure that promotes economic development, they limit private-sector investment opportunities. Therefore, one of the keys to local investment in communal areas is the creation of tenure security for the people who have occupied their family allotments for generations. In support of this contention, Heitger (Winter 2004, p.384) argues that the promotion of economic development without well-defined private property rights (as was attempted in the Soviet Union) turned out to be “very costly in terms of life, personal liberty and economic prosperity”. Zirker (Summer 2005, p.127), writing about inequities in ownership in Brazil, notes that ownership is a privilege of the elite and that landlessness is the lot of the masses, and voices the demand for a re-evaluation of the distribution of property ownership. Further, and particularly in Western countries, the owner of a land right can use his or her title deed as security with a financial institution in order to raise a loan (Blair et al, 2005, pp.50–52). Land rights have worked in the West, and they have worked in South Africa: through the generation of active capital from formal property rights, many South Africans have realised their dreams of improved economic security. Conversely, those who do not have anything but insecure tenure perceive that the Traditional Community provides them with little more than some form of social security (Goodwin, 2014, pp.5–6). Section 25 of the South African Constitution (Republic of South Africa, 1996) clearly states that: “no law may permit arbitrary deprivation of property”? The Constitution further places an obligation on Parliament to ensure, through the enactment of legislation, that all people and communities are provided with secure tenure. It therefore seems illogical (at least to the researcher) that the South African land administration system still retains what Mamdani (Fall/Winter 2002, p.53) refers to as the “bifurcated legal structure” created by the colonial practice and apartheid laws of the former regime. The Land Summit meetings held throughout South Africa during the middle of 2005 indicated overwhelmingly that the people of South Africa want to own land. One reason, as Nonyana twice states in her article on resolving tenure disputes in rural communities (Nonyana, June 2004, p.3, 7), is that “Land ownership is associated with power.” Mobumbela, in discussion with authors Kayser and Adhikari (2004, p.330) declares that “when it came to the question of land, people were prepared to die.” These perspectives are understood in the context of property rights being, according to Zirker (Summer 2005, pp.129–130), a “legal, equitable, or moral title or claim to the possession of property” and the “enjoyment of its privileges … [free] from interference by others, particularly the government”. de Soto’s hypothesis of why capitalism has failed everywhere except in the West (de Soto, 2001, p.55) argues that the reason for its success is that only in the West is property easily tradable and transferable. Hanlon (September 2004, p.612–614), however, questions whether it is exclusively the western-type freehold title as proposed by de Soto that increases efficiency in the land market? Instead, he suggests that the World Bank’s policy (i.e., Deininger, 2003) dismisses de Soto’s hypothesis. Nevertheless, de Soto’s record of historical fact still stands: the United States was no better off in the 19th century than is Africa today (de Soto 2001, pp.15–16). Their pioneers were seldom more than adventurers and fortune-seekers; yet, once the United States government of the day had recognised the claims of the settlers as legitimate land rights, the new owners had a greater incentive to invest in their land, which has supported the US in becoming the economic power it is today (Deininger, 2003, p.27). Nevertheless, there are some dissenting voices to the clamour for property rights. Zirker (2005, p.126) argues that property rights are essentially a Western capitalist concept and this is supported by de Soto’s hypothesis of why capitalism has failed everywhere except in the West (de Soto, 2001, p.55). A reason given for the success of capitalism in the West is because capitalism works best where property is easily tradable and transferable (PLAAS Policy Brief, October 2005). However, in a market economy, the poor are the most vulnerable and often their only means of generating capital is through the sale of their property. Even though they may own the land that they occupy, they do not have the means to secure credit and they seldom have the capacity to repay a loan. The PLAAS policy brief therefore argues that individual ownership actually decreases the security of tenure of many occupants. This position is supported by reference to a study carried out in an economic housing development in Joe Slovo Park, Cape Town. Hence, PLAAS believe that the property market promotes capitalism at the expense of livelihood security of the poor. Are these truly justifiable reasons to oppose private property rights? It is common knowledge that there are huge variances in the monetary value of property, depending on its location and its useful resources. However, the author supports the contention of Azhar (October 1993, p.118) that land has no value at all to the occupant until he or she has the right to own and to trade it and to harvest the resources it provides. Even so, much of the value of the land is determined by the land market, which is not concerned about the livelihood security of the occupant, especially where the occupant is very poor! In all three cases – that of PLAAS, Munoz-Pina, and Amin and Thrift, therefore, very valid concerns are raised, but their concerns should be matters to protect against when creating land rights, rather than being reasons not to issue private property rights. This research needed, therefore, to look beyond the market value and tradability of land. UN-Habitat’s document entitled “Global Campaign for Secure Tenure” (1999, p.7) advocates secure tenure because the body believes that it ensures there is progressive and sustained improvement in the living conditions of the beneficiaries. Further, the provision of secure tenure advances the fulfilment of Target 11 of Goal 7 of the Millennium Development Goals – “to achieve a significant improvement in the lives of at least 100 million slum dwellers by the year 2020” through increasing the “proportion of people with secure tenure” (i.e., Indicator 31) (UN-Habitat, 2003, p.26). Subsequent to the Millennium Development Goals, the United Nations established an Open Working Group (OWG) of Sustainable Development Goals to define agreed goals for the post-2015 Agenda. The OWG has developed 17 goals with 169 targets. Proposed Goal 1, target 4, reads: “By 2030, ensure that all men and women, in particular the poor and the vulnerable, have equal rights to economic resources, as well as access to basic services, ownership and control over land and other forms of property, inheritance, natural resources, appropriate new technology and financial services, including microfinance” (Open Working Group, 2014, p.7). While UN-Habitat literature referred to above may have had its focus on urban areas, it is important to note that urbanisation of many Traditional Community areas is taking place, especially where they are in closer proximity to existing metropolitan areas. These are highlighted in the research by Mogale, Mabin and Durand-Lasserve (April 2003). Secondly, if the lack of security of tenure is a limiting factor in urban areas, how much more so in the rural parts of the Traditional Community areas, where occupants have very little other than a tenuous right to build a homestead and whose livelihood is gleaned from a communal share in the land? For this reason, the Public Service Commission Report (2003, p.10) highlights the fact that any tenure system should exist primarily as a protection for the poor, who have no other mechanism to defend their occupational rights, and, as PLAAS (October 2005) emphasises, not as a marketable commodity. More than leaving the poor at the mercies of the capitalist market, this formal recognition of occupation provides legal protection, and hence diminishes the fear of forced eviction (UN-Habitat, 2003, p.28); it provides the right holder with “status and citizenship” (ibid, p.7) and it provides equal rights for all, as it provides a mechanism to overcome discriminatory practices (ibid, p.32). Secure tenure is also one of the most important catalysts for, firstly, attracting large-scale capital necessary for comprehensive slum upgrading and, secondly, to encourage the urban poor themselves to invest in their own dwelling and communities (ibid, p.28). it limits the ability of outsiders (especially government officials) to allocate rights without community support – hence placing a check on corruption and rent-seeking activities. Enemark et al (2014, p.14) summarises all of the above by concluding that: “Sound land administration systems deliver a range of benefits to society in terms of: support of governance and the rule of law; alleviation of poverty; security of tenure; support of formal land markets; security of credit; support for land and property taxation; protection of state lands; management of land disputes; and improvement of land use planning and implementation.” All these examples provide substantial support to the suggestion that secure tenure is beneficial to those afforded it, but in particular to poorer people. The arguments therefore swing in favour of clearly documented and identifiable land rights that provide secure tenure for the people. On the other hand, people deprived of secure tenure have no means of securing their assets and are therefore held in the grips of poverty. Wood (May 2002, p.30) argues that, “In a land-abundant developing region, the most obvious asset is land itself. The extremely unequal distribution of land in colonial times was a root cause of Latin America’s chronic income inequality”. Moreover, the World Bank Investment Climate Surveys (World Bank, 2005, p.43) indicate that, firstly, cost, secondly, access to finance and, thirdly, access to land are three constraints that have had a negative impact on private sector activity. Further, “… although significant improvements have been made in the provision of services, the poor remain deprived of many public [facilities] necessary for entrepreneurial activities (such as property rights, public safety and infrastructure), and incur high costs in time and expense when trying to obtain these” (Gantsha, Orkin and Kimaryo, 2005, p.51). Until this happens, the traditional areas will remain within the realms of the informal economy, excluded from information, development, business services and access to credit. Simply put, people are less likely to invest in their property if it is not theirs! Yet, land rights alone do not generate wealth (Braithwaite, 2007, p.9). Demanding expenses of agricultural activities and the unpredictability of external forces such as drought and floods have sunk many aspirant farmers. Knowledge, skills and capital are all essential additives to reduce the risk of failure, and these are scarce amongst the poor. Nevertheless, without secure property rights, there is even less chance of success. While the author is convinced of the benefits of the security afforded to people by a land tenure system, it still needed to be determined if this is what people who occupy land with insecure forms of tenure actually want. Therefore, the author, with assistance from a team of fieldworkers, interviewed individuals who either lived permanently in a Traditional Community or considered a communal area to be their “home”. Leedy and Ormrod (2005, p.207) suggest that, for a large population, a sample size of 400 should be adequate. (Estimates mentioned earlier suggest that the communal areas have a population of around 15 million) In this research, a total of 717 responses were received, which is considered to be representative of all members of Traditional Communities of South Africa. In addition, several photographs, taken by the author and his family during journeys made through the Traditional Communities in the Eastern Cape, Free State, KwaZulu-Natal and Mpumalanga, add external observation that complement the findings of the research. The photographs provide widespread observational evidence of the existence of informal land tenure rights where none are documented in a formal land administration system. The research ascertained whether land rights are wanted, through seeking answers to the research question: “Why would Community Authorities and members want to convert their de facto land occupation into de jure land tenure, i.e., what are the perceived advantages?”. The questionnaire endeavoured to gain further insight to the answer through a second question: “If your family obtains a title deed to their land allocation, what would this mean to your family?” The author made some attempt during the capturing process to group these responses, yet still came up with around 100 different types of answer. There were, however, a few broad patterns and these are shown as 21 different categories in Figure 1 below. Of the 717 respondents, 15 respondents answered “don’t know” and a further 97 respondents left the question unanswered. This makes up 112 of 717, or 16% of the total. A further 158 respondents (22% of the total number of respondents) gave answers that suggested a lack of understanding of the question, as they gave answers such as “happy” and “yes”! It is noted that some discussion in groups took place over the questions, as there were often several similar or identical answers from the same community. While this may have detracted from personal opinions, it would certainly bode well for the future of land rights if people have already started to foster a common thinking towards their creation. Even when the answers indicated a lack of understanding, as shown through testing the responses further on in this research, there is an overwhelming indication of the expectation that benefit will result from receiving a title deed. Figure 2 demonstrates that 75% of all respondents gave an answer that indicated positive sentiments toward receiving their own land rights. A further 6% declared their interest in the concept. 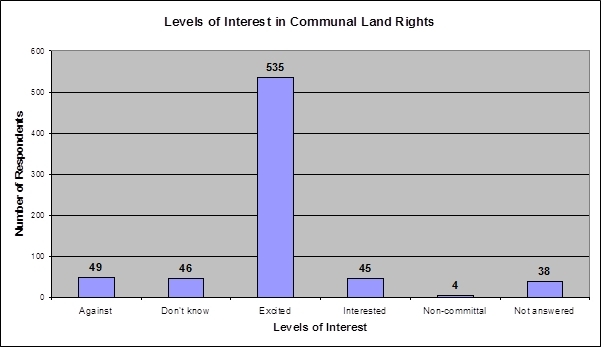 This is compared with less than 7% of respondents who indicated that they are against receiving their own land rights. The actual figures have been summarised in the table below. Notwithstanding that 81% of respondents indicated interest in obtaining a visible record for the land that they occupy, a large proportion of these provided no evidence to show that they understood the concept of land rights. Most importantly, there were four issues that the answers highlighted. Firstly, 17% (123 respondents) saw the demarcation and record of land rights as some form of proof, assurance or confirmation of ownership. Secondly, 193 respondents (27%) recognised the title deed as providing ownership to the land that they occupy. This may be an unintentional difference, but there is nevertheless a clear distinction (at least in the author’s mind). The first group suggested a belief that their occupation is tantamount to ownership of the land, and need the documentary evidence to prove it, whereas the second group seem to have recognised that their occupation is not ownership, but the public record would confer ownership. These two groups combined represented 316 respondents, or 44% of 717. The third issue that is highlighted is that only 20 of the respondents (2,8%) stated outright that they did not want title deeds or gave negative connotations to the concept of title deeds – such as “oppression”, “expenses” and “the end of tribal land”. This is a small minority, but, of course, it cannot be ignored or deemed inconsequential. Lastly, only one respondent commented on the notion of a land market and another respondent mentioned that it would provide access to loan finance – often the key reasons given in the West for the institution of land rights. 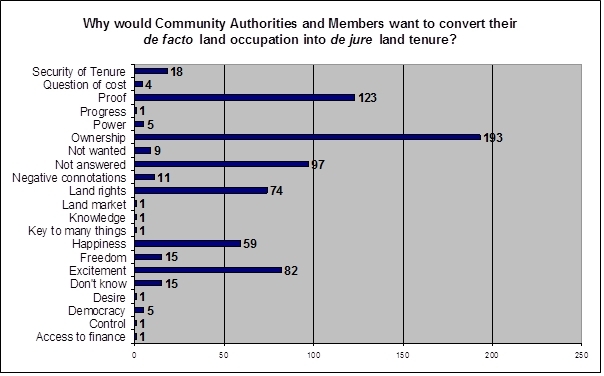 This research shows, therefore, that the overwhelming majority of the respondents, all of whom are members of traditional communities, desire the conversion of their de facto land occupation rights into de jure land tenure rights. The results are therefore conclusive – there is an informal allocation and demarcation of land rights in Traditional Community Areas that can be brought into a public registry of property rights, which is currently based on diagrams and title deeds. This research, therefore, advocates that a key to the economic prosperity of South Africa is an effective legal infrastructure of property rights and land administration in communal areas that promotes the security of tenure. At the XXIII Fédération Internationale des Géomètres (FIG) Congress held in Munchen; Germany from 8th – 13th October 2006, Hans-Erik Wilberg, Executive Director of the Swedish Lantmäteriet, commented that: “Land is one of the most valuable assets and an important base for the development of the wealth of a nation. Good land administration is essential for the development of an effective land market and a secure financial sector and will provide a basis for land management and land taxation. To unlock that wealth, a nation must develop a framework of land and property laws, effective public institutions, secured procedures and processes and an effective information system”. In addition to this, a good land administration system also provides proof to the owners of their inviolable rights, protection to the owners against unjustifiable loss, the right to the exclusion of others to utilise the land and its resources, the right to succession of heirs, and a unique address. But most important of all, it provides the owner of that right an identity – a place of belonging and of self-worth! The concept of ownership, land rights and title deeds goes much further than the ability to buy and sell property. Some of the answers given by people excited to receive title to the land they occupy are that it provides visible evidence, it gives security of title, and it brings permanence, protection and pride. Do people want land rights? The people have spoken, and the answer is overwhelmingly: “Yes”! “Amandla ngawethu!”  ”Amandla ngawethu” is an isiXhosa phrase meaning “the power is ours”. ASGISA (2006), Accelerated and Shared Growth Initiative – South Africa (ASGISA) – a summary. Pretoria, the Presidency, Republic of South Africa, pp 1 – 17. Azhar, R. A. (October 1993), Commons, Regulation, and Rent-Seeking Behavior: The Dilemma of Pakistan’s Guzara Forests. In Economic Development and Cultural Change, Volume 42, Number 1. Chicago, University of Chicago Press, pp. 115 – 129. Braithwaite, B. (2007), Land alone will not generate wealth. In The Witness, Monday, March 26, 2007. Pietermaritzburg, Natal Witness, p. 9. De Soto, H. (2001), The Mystery of Capital – Why Capitalism triumphs in the West and fails everywhere else. London, Black Swan, pp. 14 – 68. Deininger, K. (2003), Land Policies for Growth and Poverty Reduction. Washington, Co-publication of the World Bank and Oxford University Press. Department of Land Affairs (July 2004), End of a Colonial Era: Questions. In Tenure Newsletter. Pretoria, Department of Land Affairs, p. 12. Department of Provincial and Local Government (2002), Draft White Paper on Traditional Leadership and Governance. In Government Gazette, No. 23984, dated 29 October 2002. Pretoria, Government Printer. Durang, T. and Tanner, C. (March 2004), Access to Land and other Natural Resources for Local Communities in Mozambique: Current Examples from Manica Province. Proceedings from GreenAgriNet Conference on Land Administration. Foulum, 1 – 2 April 2004. Enemark, S. et al. (2014), Fit-For-Purpose Land Administration. A joint publication by the Fédération Internationale des Géomètres (FIG) and the World Bank. Frederiksberg, International Federation of Surveyors, Publication No. 60. Fédération Internationale des Géomètres (FIG) (August 2004), Marrakech Declaration: Urban-Rural Interrelationship for Sustainable Development. Frederiksberg, International Federation of Surveyors, Publication No. 33. Gantsha, M., Orkin, M. and Kimaryo, S. S. (2005), Overcoming under-development in South Africa’s second economy: Development Report 2005. A joint report by the Development Bank of South Africa, the Human Sciences Research Council and the United Nations Development Programme. Halfway House, Development Bank of South Africa. Hanlon, J. (September 2004), Renewed Land Debate and the “Cargo Cult” in Moçambique. In Journal of Southern African Studies, Volume 30, Number 3. Abingdon, Taylor and Francis Ltd, pp. 603 – 625. Harrison, P. (1994), Global Economic Trends – Some Implications for Local Communities in South Africa. In Urban Forum, Volume 5, Number 1. Johannesburg, University of the Witwatersrand, pp. 73 – 89. Heitger, B. (Winter 2004), Property Rights and the Wealth of Nations: A Cross-Country Study. In Cato Journal, Volume 23, Number 3. Washington, D. C., Cato Institute, pp. 381 – 402. Kayser, R. and Adhikari, M. (2004), Land and Liberty! The African People’s Democratic Union of Southern Africa during the 1960’s. In South African Democracy Education Trust: The Road to Democracy in South Africa, Volume I (1960 – 1970). Cape Town, Zebra Press, pp. 319 - 339. Leedy, P. D. and Ormrod, J. E. (2005), Practical Research, Planning and Design, eighth Edition. Upper Saddle River, Pearson Prentice Hall. Mamdani, M. (Fall/Winter 2002), Amnesty or Impunity? A Preliminary Critique of the Report of the Truth and Reconciliation Commission of South Africa (TRC). In Diacritics, Volume 32, Number ¾. Baltimore, Johns Hopkins University Press, downloaded from Academic Research Library, pp. 33 – 59. Mogale, T., Mabin, A. and Durand-Lasserve, A. (April 2003), Residential Tenure Security in South Africa – Shifting Relationships Between Customary, Informal and Formal Systems. As yet, unpublished, pp. 1 – 43. Munoz-Pina, C., de Janvry, A. and Sadoulet, E. (October 2003), Recrafting Rightes over Common Property Resources in Mexico. In Economic Development and Cultural Change, Volume 45, Number 1. Chicago, University of Chicago Press, pp. 129 – 158. Myrdal, G. (1963), Economic Theory and Under-Developed Regions. London, Methuen and Co. Ltd, pp. 11 – 22 and 39 – 49. Nonyana, M. R. (June 2004), Resolving Tenure Disputes in Rural Communities. In LexisNexis Butterworths Property Law Digest, pp. 3 – 8. PLAAS (October 2005), Policy Brief No. 18: Debating land reform, natural resources and poverty. Cape Town, University of the Western Cape, pp. 1 – 6. Public Service Commission (PSC) (2003), Report on the Evaluation of Land Administration in the Eastern Cape. Pretoria, Public Service Commission. 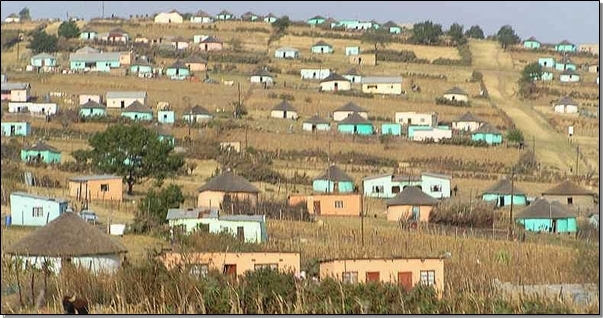 Ralikontsane, K. F. (2001), The Implementation of Secure Residential Tenure in the Rural Areas of Thaba Nchu. Johannesburg, University of the Witwatersrand, Graduate School of Public Management, Unpublished MM Research Report. Republic of South Africa (1996), Constitution of the Republic of South Africa, 1996 (Act No. 108 of 1996). Pretoria, Government Printer. Stamm, V. (2004), The World Bank on Land Policies: A West African Look at the World Bank Policy Research Report. In Africa, Volume 74, Number 4, pp. 670 – 678. UN-Habitat (2003), Handbook on Best Practices, Security of Tenure and Access to Land: Implementation of the Habitat Agenda. Nairobi, United Nations Centre for Human Settlements. Wood, A. (May 2002), Could Africa be like America? Proceedings of the Annual Bank Conference on Development Economics. Washington DC, World Bank. World Bank (Wolfensohn, J. D. and de Rato R.) (2005), Global Monitoring Report 2005. Washington, International Bank for Reconstruction and Development. Zirker, D. (Summer 2005), Property Rights, Democratization and Military Politics in Brazil. In Journal of Political and Military Sociology, Volume 33, Number 1, pp. 125 – 139. Chris Williams-Wynn grew up in the Eastern Cape, South Africa, and went to school at St Andrew’s College in Grahamstown. After school, he completed a BSc (Honours) degree in Land Surveying from what is now the University of KwaZulu-Natal and has more recently completed his Masters in Public and Development Management at the University of the Witwatersrand. He is a Registered Professional Land Surveyor, a Registered Sectional Titles Practitioner, a Registered Township Planner and a Disability Rights Activist. Having worked for 17 years in the private sector, he moved into the government sector due to his deteriorating physical ability. Mr. Williams-Wynn was appointed the Surveyor-General: KwaZulu-Natal on 1st May 1998, and transferred at his own request to establish the Office of the Surveyor-General: Eastern Cape on 1st July 2010. Mr. Williams-Wynn travels extensively throughout South Africa and occasionally internationally, as he is an advisor to several Government institutions on land issues, with particular interest in legislation affecting development approvals. He serves on the Townships Board, the Land Use Regulations Board and the Spatial Planning and Land Use Management Steering Committee. One of his main passions is to see people in the Traditional Communities also benefit from the Land Rights system of the country. Outside of his survey career, Mr. Williams-Wynn is interested in environmental conservation, with special interests in birds and trees. This interest has benefited his knowledge concerning coastal public property and the legal position of boundaries adjoining the high water mark of the sea, rivers and estuaries. He is also a Society Steward of the Methodist Church and an active Rotarian. He is married to Glenda, a Natural Sciences Graduate, currently working as a Conservation Ecology Research Assistant and they live in Kidd’s Beach.